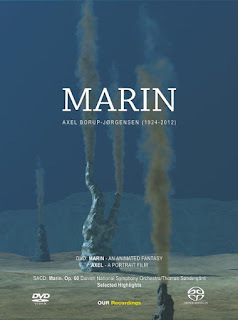 In all the SACD provides the modernist aficionado with the most freewheeling and variously instrumented introduction of Borep-Jorgensen's music I have yet to hear. No doubt the DVD film sequence adds to our appreciation as well. For that I do recommend you check out this offering. It is something of a milestone among Scandinavian New Music offerings in recent years. Nobody with an interest in the latest Modern Classical music can afford to ignore Arvo Part. And indeed why on earth would one want to, since his music has a sometimes stark grandeur, echoes of more ancient forms and a marvelously narrative demeanor that sets him completely apart among his peers? As time goes by we can more readily synthesize what he has done. A perfectly sensible and summed up offering out now is all four of his symphonic creations on a single CD entitled The Symphonies (ECM New Series 2600). So we get to hear all four in sequence, the Symphony No. 1 (Polyphonic) (1964), the Symphony No. 2 (1966), Symphony No. 3 (1971) and finally Symphony No. 4 "Los Angeles" (2008). Conductor Tonu Kaljuste and the NFM Wroclaw Philharmonic give us beautifully alive, heartfelt but measured readings of the complete output. We feel celebratory as we hear all four new readings and compare the works side-by-side. As the sequence proceeds we do feel a movement forward from a sort of attachment to "New Music" presentation gradually into the timeless eerie world of a present haunted by the memories of the past that is so much Part's special way with listeners. The conductor approaches the recording-performance as if it were one grand symphony and indeed listening we do feel a continuity and a movement more and more toward an iconically singular voice. Yet none of it sounds tentative in the least. Each phase is a confident and eloquent assertion with its own stylistic assumptions. The First in a neo-classical avant way, the Second an adept, very adventuresome collage, the Third with a turn to his special allusions to early music, the Fourth with a timeless spiritual meditation and some of his celebrated tintinnabuli form along with slowly unfolding sonic planes endlessly stretching forward. It is a sublime journey. Anyone who loves Part will find it all indispensable. Those who do not know Part would do well to start here. It is one of those releases that marks out the year as special. Can I be more plain? It is wonderful. In the world of 21st century music, there are or were those whose principal years were last century and those whose main thrust has been in the new millenium. It can matter for roots and origins in complicated ways. And in the end we can think profitably in terms of generations, and then one might find alignments, or perhaps not. Everything in the stylistic creative zone since the beginning of last century has been in a delicious state of flux and generalizations may not always hold true as readily as one might like. For now we might put all of the generalizations aside and turn to a single composer and his music. Where that music fits in will no doubt take shape as we go along in time. I am not going to try and force an easy typological judgement on the music today, though. Classification is critical for the internet yet in the end it can be too simple-minded to force something on a complex musical personality. Einojuhani Rautavaara (1928-2016) is our focus. His is a complex intersection of possibilities. He of course did a great deal of composing before the turn of this century and his musical personality stretches back to an early classic-modern period influence though his music has always tended to go its own way. 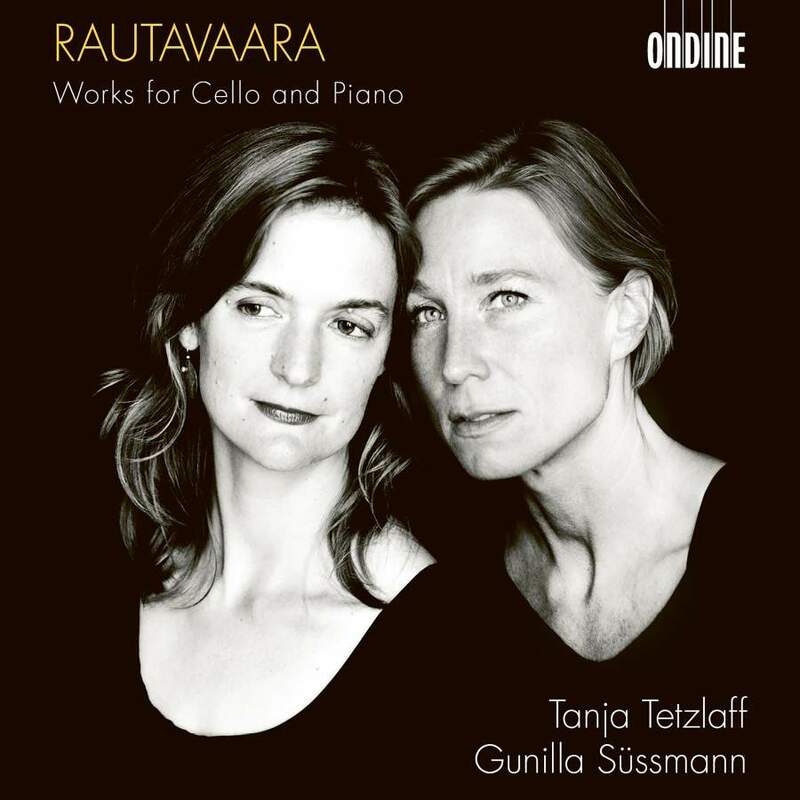 Today, most happily, we have a fine recording of Works for Cello and Piano (Ondine 1310-2), as performed with focus and rooted passion by Tanja Tetzlaff on cello and Gunilla Sussmann on piano. The program covers nicely the extended period between 1955 when Rautavaara was in his twenties through to 2000 when he had reached his 70s. The works keep a specially original style intact throughout, yet there is a great deal of growth to be sensed in that long gestatory period. Kimmo Korhonen in the insightful liners to the CD sets up a sort of dichotomy of ways to create a lifetime body of works as a composer. On one extreme end, there are those that rather early-on create a particular stylistic universe and essentially work within it throughout their career, so that in some ways each composition is a variation of each other composition, that the composer writes the "same" work over and over. On the other hand at the opposite end of the spectrum there are those who seek to create themselves anew at every moment, that realize a new possibility of music every time they write a new work. On that end perhaps we might think of Stockhausen. On the other end there is Vivaldi? Korhonen argues, to my mind rightly, that we most fruitfully can place Rautavaara in the middle of the spectrum. There is a neo-classical/neo-expressionist continuity to be heard in these cello-piano works for example, and yet each takes on its own special character within the continuum. And in part the variable can be the degree of Modernity, so to speak? Some veer closer to the tonal end of chromaticism, others let go a bit more on the strength of a tonal center. Either way there is a a musical voice that calls out its individuality at all times. So we can gain much from the form seeking yet mystically mysterious worlds of his Sonatas for Cello and Piano (No. 1 1973-73/2001 and No. 2 1991) We can hear the wonderful boldness of his 1955 "Two Preludes and Fugues." And there is the deceptively austere expressions of the Sonata for Cello Solo (1969). It fleshes out in your mind the more you listen. There is no simple characterization of the music on this program. It is lyrical in its deep structure yet does not often wear that lyricism on its sleeve, so to speak. It is music that bears repeated listens by revealing a bit more of itself at each pass. It is a feeling person's music. But it is also a thinking person's music. Very recommended for where we have been recently in our Modernity and its endless permutations. Highly recommended. 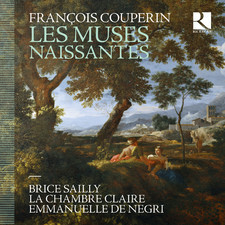 The music of the brilliant French Baroque Master Francois Couperin (1668-1733) seems as timely and as welcome as ever. Now that we are at the 350-year-anniversary of his birth, there have been some worthwhile albums coming out to celebrate the occasion. A fine one of them is Les Muses Naissantes (outhere RIC 387). It is a well-seasoned and vibrant exploration of Couperin gems, many of which I do not remember having heard before. There are some charming harpsichord solo pieces played nicely by Brice Sailly, some worthy chamber pieces with Sailly and Le Chamber Claire, and some songs featuring soprano Emmanuelle de Negri and the ensemble. There is to be found some genuinely spirited music and plenty of the sweetness you can hear readily in the luminaries of the French Baroque. The intertwining shifts in instrumentation and mood make for a nicely varied program. The period-faithful performances have liveliness and surety that mark the entire program as notable. Ms. de Negri, Mr. Sailly and La Chambre Claire are emminantly gifted and excellently suited to this repertoire. If you love Couperin, here is a fine addition to your collection. If for some reason you have yet to get acquainted with this lyrically alive and deeply expressive exemplar of French musical arts, this would serve well as an introduction. I for one am glad to have it. The prolific Carson Cooman has been producing an enormous output. Hundreds of works. An earlier volume of his organ music, Litany, I covered on these pages last March 11, 2014. 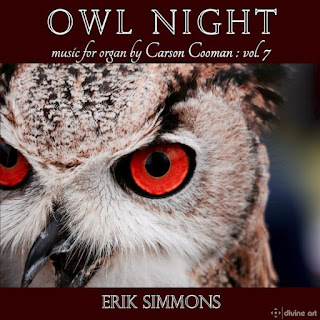 Today we consider the latest volume of his organ music, Volume 7, Owl Night (Divine Art 25163). I have not heard anything from Cooman that was not well-crafted and engaging. Owl Night is that and a good deal more. It is orchestral-depth organ music in the grand tradition that characterised the French school from Franck to Messiaen. That is not to say that you readily hear an influence so much as it has a beautifully dynamic mysterium and big sweep, not unlike the most ambitious French School organ music that we who love organ music find so appealing. The music on this volume was written in the second half of 2016 and the first half of 2017. It covers a good deal of ground. So "Two Mantras" manipulates repeating figures and variations on them as well. "Owl Night" is a moody, quiet reverie. "Concert Piccolo" uses a 12-tone row previously utilized by Eberhard Kraus in a work of the same name. The piece is in memoriam. "Two Fantasias" utilizes the same musical materials for contrasting movements, one bittersweet atmospherics, the other triumphant and majestic. Finally five Preludio, a Postludium, and a "Toccata, Aria and Finale" send us off with flair. Quietude and extroverted majesty alternate for a most fitting conclusion. There is a deeply organ-ic experience available in this volume. There is much to assimilate and richly so. It is not un-Modern, it is un-self consciously Cooman Modern. And it is a very good thing, that. I recommend this to anyone who loves the organ. And anyone who has not yet experienced Carson Cooman and seeks a living voice of distinction in New Music. Good music. Very good. Worthy of your ears, certainly. Some days are just not ideal. Yet you drag yourself to the computer anyway. Happily the music today has an aura that presents itself to me easily and so writing up today's column will be simplicity itself. Hovhannes (1911-2000) has appealed to me since I came across his Lousadzak MGM recording as a cutout when a freshman in high school. I immediately fell under the spell of the two compositions on that record. He was the first and remains one of the most important of the "Ethnic Moderns" I have happily come to know on my years of earth thus far. His mystical vision and incorporation of Armenian, Indian and other Asian-located musics is in the end ultimately situated in a highly original matrix all his own. This is music that could only be termed Modern in most all senses, yet it too has a timelessness. So we have a new one, a recording of wind chamber ensemble works that include his Suite for Band, October Mountain and The Ruins of Ani (Naxos 8.559837). Four of the ten works on the album are World Premiere Recordings, and that in itself marks the release as worth noting. The music gets capable and careful treatment in the hands (and lips and teeth) of the Central Washington University Wind Ensemble and selected soloists. The music ranges in time (1948-1985) and instrumentation (from full wind band to solo flute and much in between). Many Hovhannes acolytes will recognize the classic "Suite for Band" (1948) from earlier recordings. This version rivals versions I have studied. The previously unheard works are worthwhile, the other works done nicely. In all this is a nice one to have if you are a Hovhaness admirer. It may not be my first choice for a new listener. Yet at the Naxos price you cannot go wrong. Recommended. On December 30, 2013 I reviewed music by Kara Karayev on these pages. Here we are some nearly five years later and I have another one to bring up. Today there is a new CD of Karayev's "Symphony No. 1" and his "Violin Concerto." They are played enthusiastically and quite respectfully by the Kiev Virtuosi Symphony Orchestra under Dmitry Yablonsky. Janna Gandelman is the violin soloist and she sounds well. The music itself is the main attraction. Karayev (1918-1982) is considered the father of modern Azerbaijani classical music yet too he was aligned in the camp of the Russian moderns. The two works on the album are a nice contrast. The "Symphony No. 1" was written in 1943 and seems very much Russian Modernistic with the sort of lively severity Shostakovich did so well. Yet this is more than an an extension of that influence, for it travels far into a very vibrant palette of expression, dark and then brilliant, somber and then heroic, but serious, always even though there is a sarcastic playfulness to be heard, too. 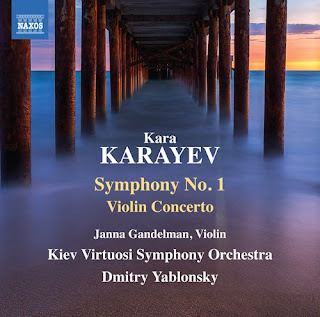 The "Violin Concerto" jumps ahead to 1967 and Karayev's very personal take on Serialist possibilities. There is even more of the Modernist to be heard, yet it very much sounds pan-Russian-Azerbaijanian in an individual way. These two works bear much fruit on close inspection. They are neither inconsequential nor lightweight. They are convincing reasons why Karayev should be heard today. For he holds his own. Very well. I don't suppose I will raise too many eyebrows if I say that Prokofiev's ballets to me rival those of Stravinsky. Well, maybe a few. It is hard to top "The Firebird," "The Rite of Spring" and "Petrushka." Nevertheless Prokofiev's "Cinderella" and "Romeo and Juliet" have an nearly equal power and charm to my mind. That does not mean they have had equal historic importance. Yet history is something that has passed and contemporary evaluation via continued performances is perhaps something else altogether. History is made. Contemporary appreciation either exists or it does not. Since music should best not be viewed as a kind of horse race, since in the end once a composer is gone there is no true advantage of edging out a rival, none of this matters today. So for example when I find the Complete Ballet of Prokofiev's Romeo and Juliet is available in a new version, I do not stop and try to rank its place in the pantheon. I simply want to hear it. And so I have gotten a copy and have been listening. 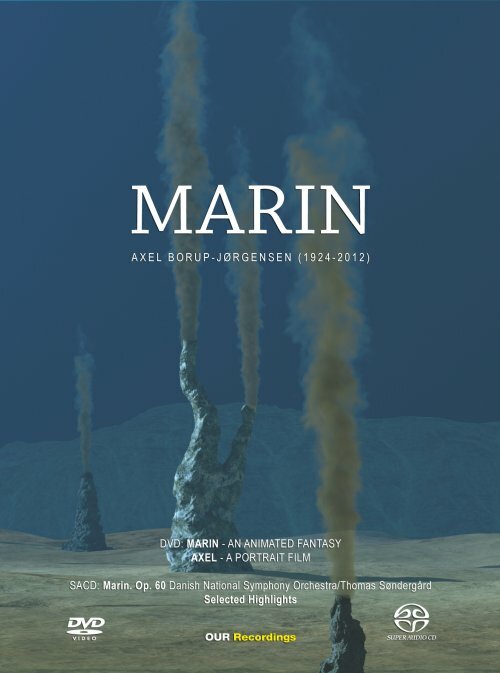 It (Naxos 8.573534-35 2-CDs) is performed by the Baltimore Symphony Orchestra under Marin Alsop. Based on Alsop's cycle of Prokofiev's symphonies I knew the chances were good that she lavished an equal care with the ballet, and my expectations have been confirmed after a number of listens. By the time Prokofiev conceived of and wrote the ballet (1935-36, 1939) the Soviet Union was developing a set of guidelines that amounted to a judgement irrespective of context of what works were or were not acceptable to the regime. So were sad endings permissible? It sounds ridiculous now, but that was a huge issue. So much so that Prokofiev's original version had Romeo and Juliet's mutual suicides avoided through a last-minute intervention by Friar Lawrence. The ballet was essentially prevented from having a full performance for a number of years because of the sad ending heresy! Anyone who knows Prokofiev's musical personality must also know that a happy Romeo and Juliet would not be something Prokofiev would gravitate towards, since there is a bitter-sweet happy-sad element to his music at its finest. It is a key to the power of his music and also the power of Shakespeare's play. So we ultimately should be glad Prokofiev had the courage to follow the story as it was intended to be told. The complete ballet has some of Prokofiev's most moving passages and all-in-all it has great appeal regardless of the circumstances of its making. Marin Alsop and the Baltimore Symphony come through with a detailed, spirited and impassioned reading of the complete opus. This may not be Prokofiev at his most Modern, in spite of some huge dissonances and some idiosyncratically hard-edged moments in the score. It hardly matters or it should not when the music is this transcendent and lasting. The memorable lyrical-brittle music for this ballet speaks to me as much as ever, in no small thanks to Alsop's loving attention. It is nothing short of a triumph, I must say. If you have not spent time with the complete Romeo and Juliet, here is the chance to do it with an excellent performance at a nice price. If you are a Prokofiev-aholic and have one or more versions, I suspect this version will be so balanced that you might well profit from adding it to your collection. For many years, in fact up until recently, the only music I'd been able to hear of Charles Villiers Stanford (1854-1924) was a few scattered choral works. By a not especially detailed look at such music I thought of Stanford as maybe a little Elgar-like, slightly stodgy and Victorian? In fact when you listen closely to Elgar that view is not uniformly warranted, so also Stanford. What I discovered in these new releases was the relatively untold story of a major figure in the English Modern Compositional Renaissance--not at all Modern in our accepted sense but neither all that Romantic. And not so stodgy, either. 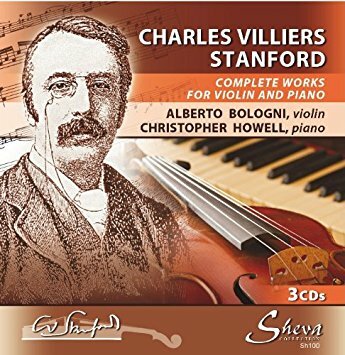 That impression is born out by the welcome addition of a three-CD set of his Complete Works for Violin and Piano (Sheva Sh 100). Pianist Christopher Howell seems perfectly suited for the music, as he did for the solo piano works. His partner for this project is violinist Alberto Bologni, who acquits himself in a fine manner as well. The music is nicely straightforward, tuneful, lyrical at times, never pretentious, not primarily virtuoso-oriented, a sort of English Chabrier in the focus on musicality. The folk and folk dance related pieces are the most charming but there too are some very nice moments of unvarnished song and instrumental singing. I imagine this might have made quite attractive salon music at the time. Today it stands out as remarkably down-to-earth music, not exactly fragile and sometimes robust yet also un-mawkishly tender too. Some of the rhapsodistic music veers firmly into Romanticism yet it does so almost folkishly and not at all idiomatically. In this way the music transcends era to be patently timeless. Yet it is very much of its time. In this music we can hear what for Stanford was a stance on being Anglo, on being an English composer that we now can see was in the air as a result. It helps explain and situate the very individual furtherance of a local style in the music of Vaughan Williams, Holst, Walton and the rest. Plus it is very enjoyable music in its own right. There are no great strides taken harmonically, nor are dissonances a factor, understandably. Yet too it is a definite break from any traces of Germanic Romanticism and a freeing up of the local to be itself. So in the end I cannot but recommend this set to anyone who seeks to ground fully in the origins of the Modern English Renaissance. The works here are delightful in themselves. It is a freshening of your usual fare, no matter what that fare might be. So listen. 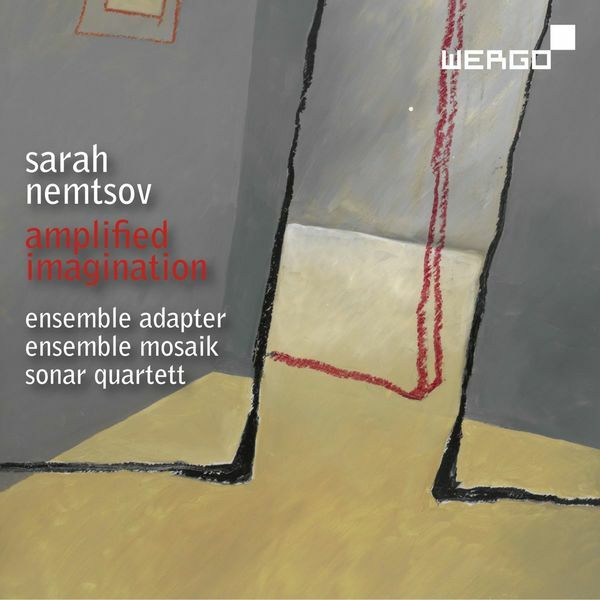 Sarah Nemtsov (b. 1980) has High Modernist cachet in my mind. I feel this way after happily exploring thoroughly her recent album Amplified Imagination (Wergo 7366 2). There are five compositions, each making use of conventional instruments along with electronic alterations and re-presentations. Each performed-recorded work occupies its own special world. So on the other spectrum of possibilities we have "zimmer I-III" which is a little more directly chamber-like with eight musicians including laptop players-transformers, amplified harp and amplified string quartet. Transformed sounds are integrated, as in a way another instrumental voice than a totally transformed ambient-timbral whole. Yet the music thrives on extended techniques so it is never a for-granted sonics. Never that. "Implicated Amplification" for amplified bass clarinet and three effect pedals is redolent and bursting with beautiful instrumentality, so to speak. Ms. Nemsov supplies that snakelike agility of an instrument with repeating patterns and timbral intersections both thoughtful and moving. It is a good example of what makes Sarah Nemtsov special. There is imaginative deliberation to all of these works. You feel after listening that there is a very alive somebody behind the contemplative and often extroverted sounds. I would say to you after listening many times, I would say listen to this without fail if you hold High Modernist and "Free" sounding music in high esteem. It is in its own way a triumph of sound over silence. Just how much piano music there is by Franz Liszt can be approximated by the fact that Naxos is now at Volume 48 of their complete set! There is no apparent let-off. This volume plays to me and I cannot help but smile as I listen for the sixth time. It, to be specific, is a recording of the Hungarian Rhapsodies Nos.12-17 (Original versions) (Naxos 8.573784). The pianist is Carlo Grante, who is not out to prove just how flashy he can be, and that is a good thing if we want to assess the original treatment and not merely be dazzled. So what have we to gain from hearing these prototypical versions? The Hungarian Rhapsodies can be profitably seen as one of the first significant forays into "nationalism" in the classical fold, which nowadays we might boil down to the use of "native" ethnicity or folk materials as the basis of a new music. It was never entirely something out of the blue, since someone like a Haydn was known to incorporate local thematic materials into his music--for example a string quartet appropriating the theme from what later most unfortunately became identified with the Nazi's as "Deutschland Uber Alles." And let us not forget how Renaissance composers often imported local songs of the day into their contrapuntal works--"L'Homme Arme" being a favorite in Masses of the time. All this to say that perhaps the nationalist element is secondary in our modern minds to the folk appropriation? If Bartok utilized Romanian elements in some of his works, are we to quibble that this cannot be the same thing since he was not Romanian? It seems wrong-headed. By the way, I reviewed a disk with some of Bartok's Romanian-themed works in a review on here a short time ago. Look at the contents index on the right. 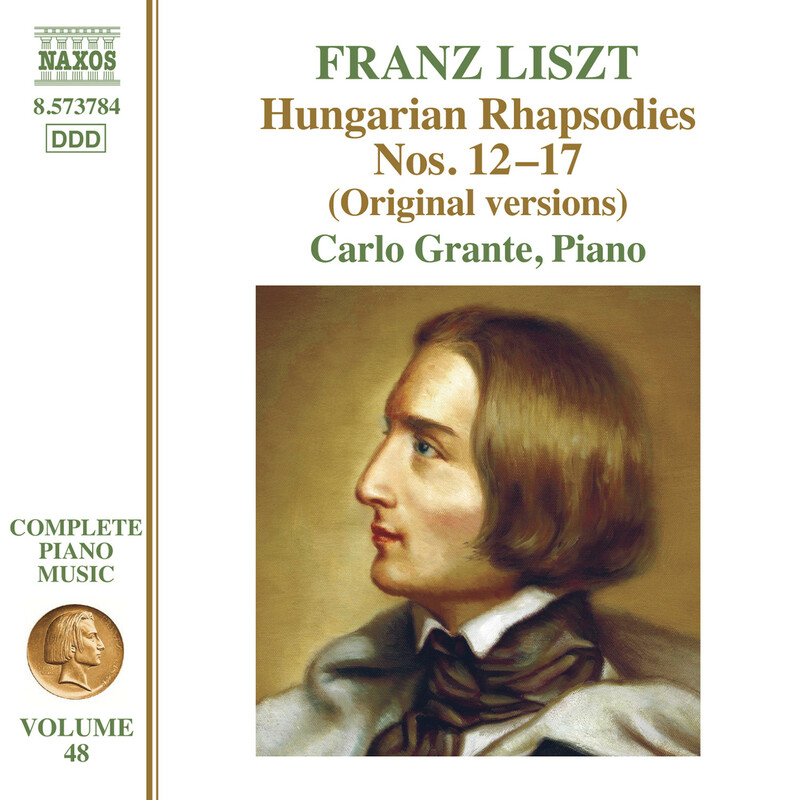 That an aside, but it nevertheless serves to situate Liszt's Hungarian Rhapsodies for us as "ethnically specific" music, and most importantly excellent music for all that. The original versions of Nos. 12-17 have all the thematic charm of the ones now much more well-known to us. What maybe is most telling in the early settings is how the treatment is not exactly typical compared to the later way Liszt developed a virtuoso pianistic style that became so influential from that point forward. Listen to some of Keith Jarrett's solo recitals patiently and you hear eventually how it is still with us. The earlier Liszt Rhapsodies are a kind of un-self-conscious approach that perhaps aims at a musicality not entirely virtuoso-centered, or alternately not always quite typical of Liszt's codified later virtuoso style. In this way and also because the varied treatment is distinct enough to give great pleasure in its own right. anyone who loves Liszt would benefit from having these versions ready to hand. Having also the related "Magyar Dalok," another alternate version of the 10th Rhapsody and "Puszta Wehmut" are all welcome additions. In short there is much good listening to be had here. Those who know and love the Rhapsodies in the famous versions will find this a delightful alternative. And in any event the performances and obscurities make for welcome fun and enlightenment. So grab this as you may. John Ogdon (1937-1989)? You may remember him as a concert pianist. I had (and still have?) his RCA recording of Carl Nielsen's piano music. He was a pianist of great interpretive power. Many may not realize that he was a composer of brilliance, completing more than 200 works in between the demands of his concert career. We have a chance to appreciate some of his remarkable music on the recent Original Piano Works (Piano Classics PCL10132). 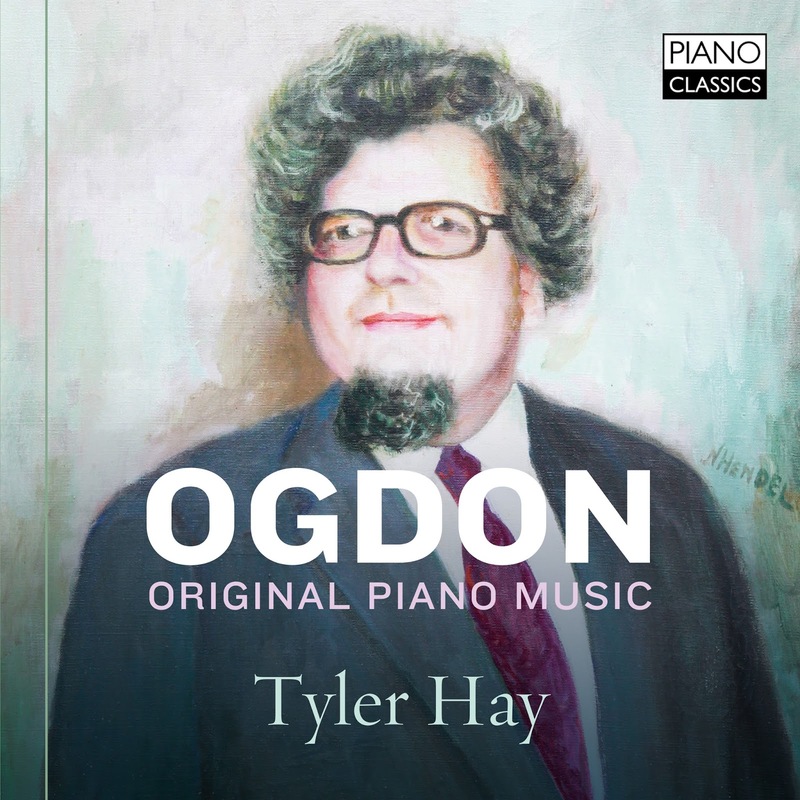 On it Tyler Hays tackles Ogdon's very technically demanding and dramatic works with genuine aplomb. I was in the dark about Ogden's music until this. I surely am no longer! All you need do is put on the CD and listen to the first work there, "Sonata 'Dedicated to my friend Stephen Bishop'". It is piano music that dramatically enacts a special passion through an intimate understanding of the piano beneath the composer's hands. There is Ivesian brinkmanship, Sorabji-Scriabin-Alkanesque-Ornsteinian Promethean demands on the pianist, and a very convincing modern internal bite that allows for cascading dissonances and structural consonance contrasts. As you listen you grasp the tone-succession syntax as music-speak of a high order. There is a commanding pianist presence to this work that Tyler Hay takes to like duckwater takes to ducks! It is a momentary shock to hear this music for the first time. And indeed subsequent listens fully bear out the first impressions and deepens them. That initial inner feeling does not at all dissipate in the subsequent program of an additional three works substantial and invigorating. There are some remarkable chromatic fugal mazes happily to negotiate and a good deal else to savor as well. I feel no let down as I listen repeatedly to his "Ballade," his "Kaleidoscope No. 1 (6 Caprices)" and his "Variations and Fugue." Ogdon is a real discovery for me. If you listen to this program and its excellent performances I think you will be as pleasantly startled as I have been. Make no mistake! If you love a modern piano world as I do, you will feel right at home with Original Piano Works. The music is a modern wonder and the performances nothing short of heroic. Deliberately slapdash piano profundity never sounded so well! When cognoscenti speak of the string quartet literature, they often mention Beethoven's late quartets as a watermark of the greatest and deepest works in the history of the medium. Yet of course his early and middle quartets are landmark works that do not fail to enchant and delight. If the early works have an affinity with Josef Haydn's quartets, it is in the way they embody structural integrity of the highest sort while expressing a beautifully balanced expressivity. If they do not probe the deepest levels of brooding introspection or climb ecstatic heights of bliss, they adroitly balance affect and ever transforming musical architecture in ways that already point to a very personal way of expression. So we very happily have a new version of Beethoven's String Quartets Op. 18 nos. 1-3 (CORO Connections COR16164). The Eybler Quartet give us their own singular readings of the first three quartets of the six that comprise Op. 18. 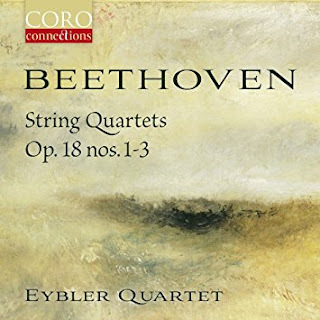 The liners to this fine recording alert us to the unusual repertoire stance of the Eybler Quartet which explains in part the unusually special reading they give these works. That is, that their repertoire sees the Beethoven Quartets as the end-point in a spectrum of possibilities for the group to master. And the notes' assertion that this view of Beethoven is "from the other side" of the timeline is telling. So too one might expect their view of the Op. 18 works would be supremely Classical and less Romantic than some well known versions we have had the pleasure to hear over the years, in my case especially the Budapest Quartet recordings. And that is very true. It is a reverse engineered Op 18 that has a brio that is more mercurial and intimate than emotion drenched. There is a subtle buoyancy to their readings, a most refreshing underplaying and removal of vibrato except for contrast in phrasings and for variable timbral presence. It seems more appropriate today to hear a less anguished, less heart-on-sleeve gushing quality in these works. And it is not to say that these readings are without feeling. They are quite feelingful. They just do not blubber so much. They do not so much openly weep as they quietly sigh. Eybler's togetherness and technical brilliance, too, are absolutely thrilling. That brilliance enables them to accentuate the near playfulness of the allegro movements, the quasi-Viennese folkish Beethoven, the contrast between sincere tenderness and bracingly swift flight. I will not go on at length about the myriad virtues of the music and its special presence with the Eybler Quartet. These are versions that serve as a critically righteous introduction to the three quartets in Beethoven's beautiful first efforts toward his very individual vision of the fourness string world. It also will be a most worthwhile addition to the collection of those who already know and love these works, for these versions give you insight into what the quartets are deep down and on their dazzling surfaces. Heartily recommended. Anton Bruckner's music came out of himself almost in spite of his everyday personality. He was a devout Catholic, a soul so timid that when an orchestra was running through one of his symphonies and a player questioned what note he was supposed to play, Bruckner was said to have responded, "whatever you'd like." He probably never even kissed a woman, which back then could have meant anything except a boldness, surely. No doubt in our modern, more canderous parlance he never kissed a man, either. His music was in many ways the opposite of his personality, except perhaps his devoutness, which was key. The music is of course bold and assertive with a cosmic hugeness far beyond most of the music others created during his lifetime, or even afterwards. His was the music not about God, or from God, it was God. Only Mahler in a certain mood could rival him for his huge cosmoses of God-like sound. That is so much the case that when I threw an "end-of-the-world" party as Three-Mile Island seemed to be cataclysmically melting down not far away from us, I immediately chose Bruckner's Symphony No. 9 as one of the soundtracks. The maelstrom of music that is the 9th seems truly like the Voice of God to me, as much as one might imagine such things. 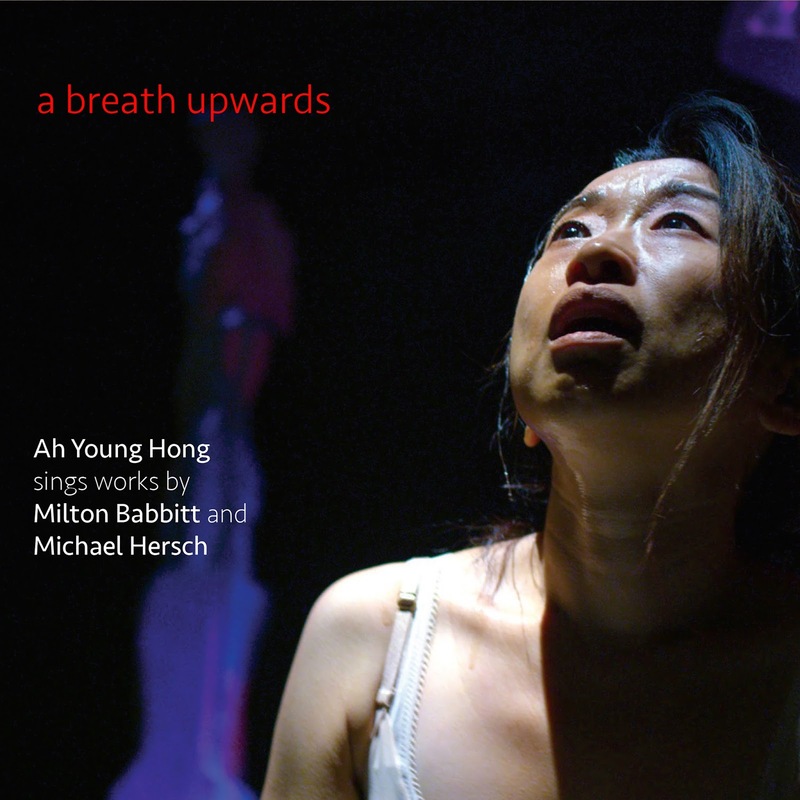 Given my life-long appreciation of this work, I do not shy away from versions yet unheard. 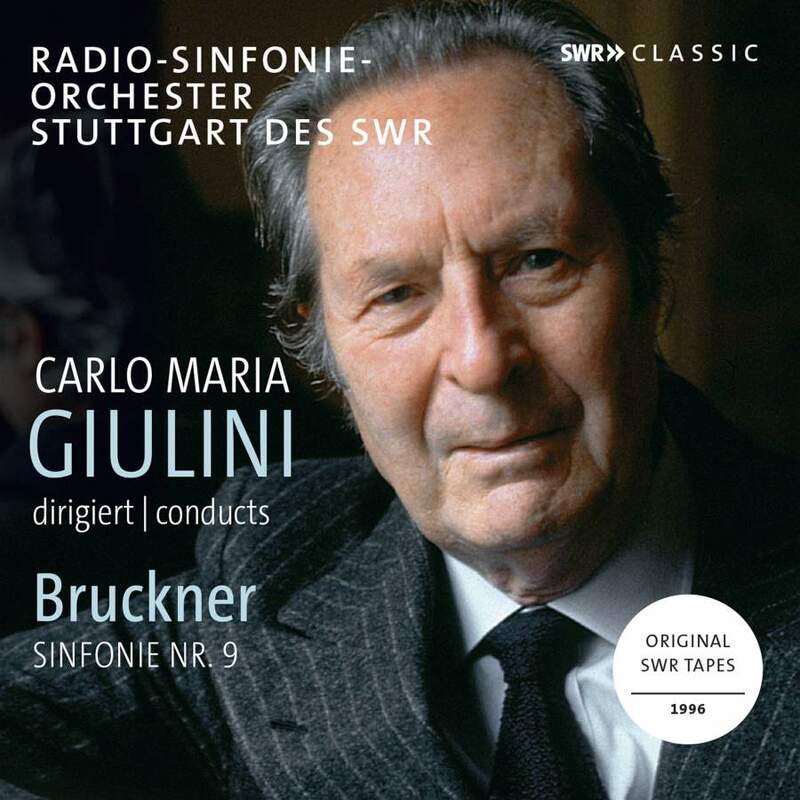 So today we have the "Original SWR Tapes, 1996" of Carlo Maria Giulini conducting the 9th with the Radio-Sinfonie-Orchester Stuttgart des SWR (SWR Classic 19411CD). It is a version that is markedly well-paced and deliberate, in no hurry to race along and fill two sides of an LP. And that is all for the best. Giulini's cosmos does not unfold rapidly, so that each section comes to a predetermined weight without haste, in a heavenly canopy that need not arrive anywhere according to a set timetable. Bruckner of course is one of the weightiest composers in terms of large orchestral girth and a stoic refusal to entertain so much as bring a heavenly world to light, to the light, to life. It strikes me on the 9th that many would-be Minimalists could learn from Brucker how repetition and periodicity could still take on a developmental forward momentum that avoids what in some hands is the mediocrity of the banal. Motivic cells germinate, spin around a vortex, then develop without obvious, filler sorts of sequencing. The 9th has this wondrously spinning quality to it at times, sometimes as slowly as a huge cosmos of bulk like the heavenly material canopy of stars above us or of large sections of the universe that slowly turn in on themselves. One way to look at it is that Bruckner takes the leitmotif idea from Wagner and looks at it like a mass of cosmic frisbees. He spins them in slo-mo throughout his musical universe, spiralling, mutating, sequentially jettisoning their way through an eternity that only lasts (practically) for over an hour. What glory is to be heard in this opening up of aural things to our manifold listening experience! Seriously. 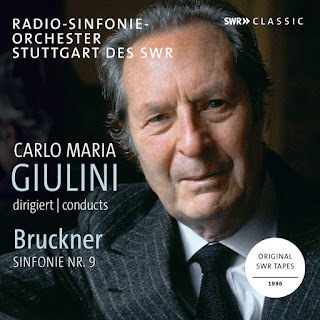 The deliberate interpretation Giulini gives us lends itself well to the stately, ponderous spin of the music of the spheres as Bruckner hears it. And we can now perhaps gauge later Bruckner not just as some sort of obviously exploded Wagner. It is also music that hears in the heavens a spinning that post-High Modernism too hears in its own way. Of necessity Bruckner could not really be the voice of God. So he is in a way the ultimate ventriloquist. God in this lushly, grandly exciting canopy is really the voice of Bruckner impersonating God! I can think no better (but a few equally) convincing versions of this most remarkable work and what it is doing. I recommend this work as essential, this version as utterly proper and majestically uber-grand! The story of why it has taken this long truly to appreciate the gifts of Mieczyslaw Weinberg (or Wajnberg in the Polish spelling) (1919-1996) has been told plenty of times on these blog pages and need not detain us. The very short answer might be simply Stalin. Weinberg was a Polish Jew forced into exile to Russia in WWII and the Social Realism dictates of the Soviet Union at the time were not conducive to what Weinberg was about as a composer. It's more complicated than that but that will do for now. The incredibly prolific Weinberg completed 17 String Quartets. They, as most quartets in the Modern Era, can be looked down upon as formalist-subjectivist by a rabid Stalinist realism. Accordingly the quartets were tainted by suspicion in the early years of life in his adopted homeland. That initial ill-will put the quartets under a cloud in the years that followed.Yet there is extraordinary music to be heard there. And Social Realism after all is a rather reductionist and delusional approach to what music is all about. Any theoretical approach that bans Weinberg has to be rejected. It is dead wrong. 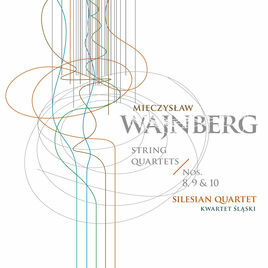 The excellent Silesian Quartet brings to us state-of-the-art performances of Weinberg's String Quartets Nos. 8, 9 & 10 (Accord ACD 241-2). The incredible beauty of the opening adagio for Quartet No. 8 lets us know just how special these quartets are. They are a product of Weinberg's middle years, the first from 1959 when he was around 40, the others follow in succession, 1963 and 1965. 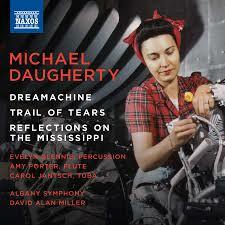 The liners to the CD make cogent mention of the autobiographical elements that appear in many of the quartets. The notes describe in 1963 the premiere Polish performance of any of his music, of the Quartet No. 8, which at the time seemed insufficiently Modern to the audience, aside from the spice of some dissonance. They were used to the High Modern search for new sonarities and innovations in form, and Weinberg was more concerned with a music that was "intensely emotional, usually melancholy, dramatic at times." Such is the substance of these quartets, intensely Expressionistic, closer to a Shostakovich (a Jewish one for all that) than someone like early Penderecki. From the vantage point of today, many will embrace these quartets for the reason that they are not Avant leaning. I myself feel that the addition of Weinberg should not be seen as a need to subtract early Penderecki, Boulez or Stockhausen. We can enrich ourselves all the more by allowing both musical visions to occupy our attention. There are deeply introspective moments in all three quartets. Compared with a Prokofiev, Weinberg is a shade more bitter than bittersweet. And in some regards he is almost unrelenting in his serious outlook. We have generally seen such approaches to quartet writing from later Beethoven on, and perhaps after a time we will come to see the Weinberg cycle as we do the Bartok, the Shostakovich, the Carter, the later Beethoven works? It is a moot point for the moment to me. What counts is to recognize the three middle quartets as very worthwhile and deeply absorbing listens, especially in these superb Silesian Quartet performances. A sober sadness gets an equally emphatic and perhaps slightly macabre folk dance rejoiner as we follow movement-to-movement and recognize the depth of all we hear on this program. There is a definite temperament in play in the Weinberg ethos. The picture as conveyed by his music is seldom exactly rosy. The events in his life gave him plenty of cause to feel that way. And we can appreciate the beautiful way he chose to express his temperament-biography in these quartets. Emotions are not funneled into musical expression in a one-size-fits-all manner. If they were music would be rather boring, wouldn't it? The triumph of Weinberg the composer is the triumph of invention over all personal obstacles. We can only rejoice at the results in this volume. Essential. With the rise of so-called Nationalism beginning in the later 19th century and onwards, the new importance of local folk forms to the Modern Classical world became obvious, yet often enough remained in an almost autonomous independance to Modernism itself. Both fed off each the other, yet could go separate ways at times while maintaining a contemporaneous existence, a happenstancial presence in the present. An excellent example of the interplay between folk and contemporary can be found in the musics of George Enescu (1881-1955) and Bela Bartok (1881-1945). Both were born in the same year and lived within a time frame that was identical, save an extra ten more living years for Enescu. Both also made extensive, pioneering use of Eastern European folk forms. 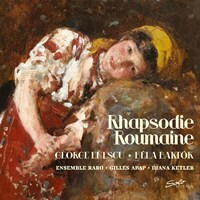 It is to the exceptional folk-based recreative music we turn with the recent volume Rhapsodie Roumaine (SoloMusica 277). On it we are treated to six compositional sets or individual works by the two, all centered around the vibrant reworking of Romanian folk moods, the rhapsody as reconceived in Modern-Post-Romantic terms. Authentic Romanian tonality-melody in the quasi-Gypsy expressive idiom makes powerful contact with the extraordinarily fertile imaginations of the two. It is a mix of the familiar and less familiar, the classics and the reworked classics, the discoveries, the more obscure. Enescu's "Romanian Rhapsody No. 1" gets a new version for piano quartet, while his exceedingly beautiful "Sonata No. 3 for Violin in A minor" receives near-ideal treatment by Gilles Apap on violin and Diana Ketler on piano. They do an exceptional job as well on the Bartok "An Evening in the Village" for violin and piano, and his equally stunning "Romanian Folk Dances. Sz. 56" for violin and piano. To top it off we hear Bartok's "Duos for Two Violins" arranged for two violas, plus the recently rediscovered Enescu "Nocturne 'Ville d'Avrayen'" for piano quartet. The music has enough modernity that you would never mistake any of it for 19th-century fare. And there is an exceptional folk detail that keeps it well out of the sort of quasi-patronizing popularizations you might encounter in earlier works of a pre-revival kind. The performances are uniformly sensitive and flamboyant as needed. The music is a joy and each piece fits fully into the thematic matrix to create a highly cohesive whole. Very recommended!